China's Jade Rabbit Rover May Be Doomed On The Moon : The Two-Way Chinese officials recently announced the rover was experiencing mechanical difficulties, and now observers believe its done for. But the thirst for more moon missions may be spreading in China. 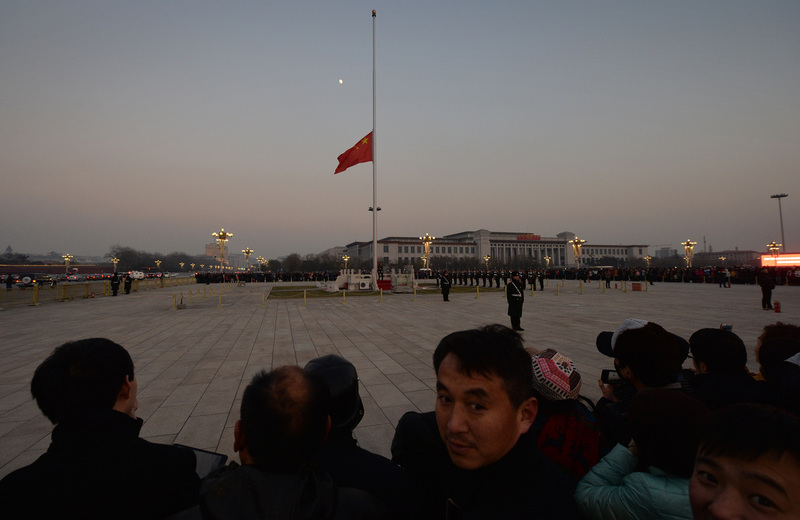 The Chinese flag is seen in front of a view of the moon at Beijing's Tiananmen Square in December, when China's first moon rover touched the lunar surface. That feat was widely celebrated — but observers believe the rover has now run into serious trouble. China's new moon rover, the Jade Rabbit, may be dead. Chinese officials recently announced the rover was experiencing mechanical difficulties, and now observers believe it's done for. The rover was part of a headline-grabbing push by China to get to the moon. On December 14, the nation's Chang'e 3 lander gently touched down on the lunar surface. It was the first spacecraft to make a soft landing there in nearly four decades. Hours later, the lander lowered its Jade Rabbit rover onto the lunar landscape. And the rover stole the show. It may have been the rover's name, or the small Chinese flag it appeared to be waving. Whatever the reason, the little six-wheeled machine captured the imagination of the Chinese. On Weibo, the Chinese equivalent of Twitter, an unofficial first-person account began chronicling the rover's adventures, as it drove in a circle around the lander and used instruments to study the lunar soil. The account quickly gained many thousands of of followers. Then late last week, the little rabbit got into trouble. "Well we don't exactly know what happened, there's not a lot of detail," says Emily Lakdawalla, a blogger and senior editor with the Planetary Society, a non-profit that supports space exploration. The rover was preparing for the lunar night time, which lasts for two weeks. It was supposed to fold up to shield its delicate electronics from the cold. That didn't happen — and now, Lakdawalla says, its circuity is done for. "It'll just break, it will physically break because of the incredibly cold temperature, and there's no way to fix that," she says. "You can't send Triple-A up onto the moon to fix your broken car. It's done." Why the rover couldn't fold up as designed is unclear. Lakdawalla says one culprit may be lunar dust. The dust is extremely fine, and it clings to anything it touches. It finds its way into cracks and mechanical systems, where it can jam things up. "It's very difficult to work with," she says. Another possibility is that there was some kind of computer malfunction that caused the rover to stop following commands from mission control. Given the cryptic statements she's seen, "my instinct leans toward a command problem but a mechanical problem is also a possibility," she says. The rover's untimely demise is making a lot of people sad, inside China and out. But Lakdawalla says it doesn't diminish the huge success of the mission. And she thinks the Jade Rabbit's life, however brief, has energized the Chinese. "The Chinese public, rather than being disappointed by this are emboldened by it," she says. "Once you've tasted a little bit of success in space exploration you want to do more, you want to achieve greater things. And it's nice to see that spirit taking off." China is already planning numerous manned and unmanned space missions for the future, including another trip to the moon to pick up a sample and return it to earth. As for the rover: it's last, unofficial words translated as "Goodnight earth!"